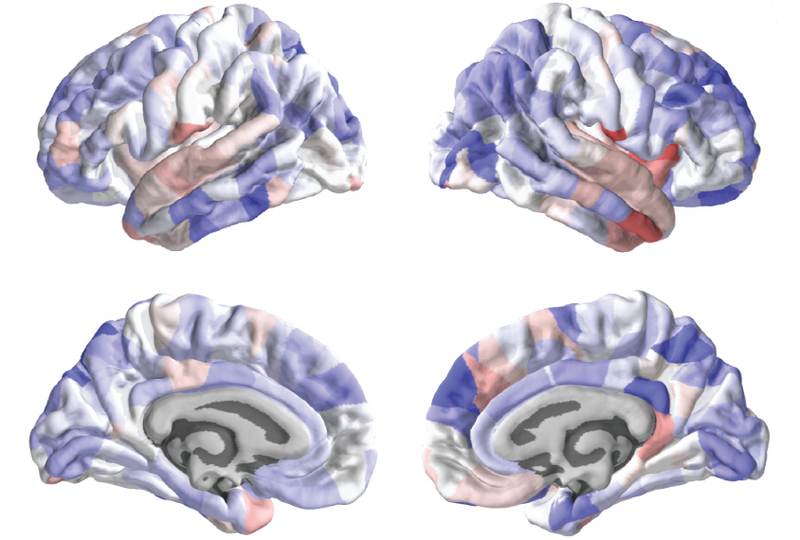 Thick and thin: Some parts of the cortex are generally thicker (red) and others thinner (blue) in people with autism than they are in controls. Some genes associated with autism influence the thickness of the cerebral cortex, the brain’s outer layer, a new study suggests1. These genes include ones that regulate synapses, the junctions between neurons. Previous studies suggest that some regions of the cortex are thinner, and others thicker, in people with autism than in controls. The new findings begin to unravel the molecular basis of these differences. The genes in play are those that tend to be suppressed in the brains of people with autism. The researchers arrived at their conclusions by comparing cortical thickness measurements from brain scans with gene expression data from postmortem brains. Bethlehem and his colleagues examined brain scans from a database called the Autism Brain Imaging Data Exchange (ABIDE). They measured the thickness of the cerebral cortex in 62 boys with autism and 87 controls, all 9 to 11 years old. The cerebral cortex coordinates various cognitive and sensory functions, some of which are known to be altered in autism. The researchers divided each individual’s cortex into 308 equal parts and measured the thickness of each part. For each region, they subtracted the averages of the control group from those of the autism group to calculate a difference score. They also downloaded gene expression data for each region. These data came from the Allen Institute for Brain Science and are based on postmortem brain samples from six typical adults. The team looked at the expression levels of 20,737 genes in each of the regions. They then used an algorithm to determine how closely each gene’s expression levels track with the difference scores. They identified more than 4,400 genes that may contribute to variations in cortical thickness. The list includes more genes involved in signaling at synapses than would be expected by chance. The researchers estimate that these genes explain about 10 percent of the variability in cortical thickness between the autism and control groups. This list shows a significant overlap with genes that have altered expression in the brains of people with autism. The overlap is greatest for genes expressed at unusually low levels in people on the spectrum. The researchers saw no significant overlap with a list of genes that carry mutations linked to autism, however. But Bethlehem says the analysis may not have been sensitive enough to detect an overlap. They replicated both of these results using two additional sets of brain scans — one that includes 48 children with autism and 54 controls, and the other 56 children with autism and 154 controls. They did not find the pattern in a third set from 69 children with attention deficit hyperactivity disorder, suggesting the link is specific to autism. The results suggest that genes altered in people with autism influence the thickness of their cortex. “That holds promise in our ability to use neuroimaging to subtype people with autism and maybe infer genetic risk from imaging,” says Armin Raznahan, chief of the Developmental Neurogenomics Unit at the U.S. National Institute of Mental Health in Bethesda, Maryland, who was not involved in the study. Still, the results should be interpreted with caution, because the gene expression data come from adults and the brain scans from children; cortical thickness and gene expression levels may both change with age, Raznahan says. Bethlehem and his colleagues are analyzing brain scans and gene expression data from people of a wider range of ages.